How easy is it for you to keep things 100 percent real? That's one of the fascinating and entertaining themes for the new late-night series The Nightly Show with Larry Wilmore which premiered Monday night on Comedy Central. Wilmore took over Stephen Colbert's old time slot not coincidentally on Martin Luther King Jr. Day, so the obvious topic of the night was about race relations and the relationship between African Americans and the police force in America. Wilmore conversed about the topic with four special guests, The Nightly Show contributor Shenaz Treasury, Senator Cory Booker from New York, rapper Talib Kweli and comedian Bill Burr. While the first segment with the guests consisted on everyone giving various opinions about the state of race relations and topics building off that central notion, the second segment with the group was the most interesting. Wilmore asked each guest a question and they had to do their absolute best to "Keep It 100" — meaning the answer would be judged on whether or not it sounded fake. The concept is a great one. If you're going to have guests come onto your show and talk about the most important, relevant and controversial topics going on in the country, why on Earth would you want them to pussyfoot around the real conversations we should be having and the real comments that need to be said? Each guest had their own special question and out of the four, only two answered their question quickly and the closest to 100: Bill Burr and Shenaz Treasury. Burr is a white male and is married to an African American woman. He was asked if he and his wife had kids and they could only pick one race to raise their child, which would he choose? To this, Burr said exactly what we're all thinking. "Judging by these statistics, white." Considering the entire episode before this question was about how much African Americans felt they were being targeted by police and the general tension between the two groups, there was no way Burr would answer any differently. Treasury on the other hand, could have taken a serious approach to the answer as she an outspoken woman who advocates for issues like women's safety. Instead when asked which side of the street she'd walk on if one side had an African American man walking down it and the other had a white man walking down it, she answered with "Depends on who's hotter." Sure the answer isn't as close to 100 percent as Burr, but she's got a point. Booker on the other hand was asked if he wanted to be president and he said no. But let's be honest, that's got to be a bold-faced lie, right? Wilmore ended his show by telling viewers that he would hold himself to the same standards as his guests and would take the last moment of each episode to answer one question and keep it 100. The questions are to be submitted through Twitter and can be anything regarding to the topic chosen by The Nightly Show. One question will be chosen every night and Wilmore will have no knowledge of the question until he reads it off the teleprompter. Next week's topic is all about Bill Cosby, so clearly there's a treasure trove of questions from which to pose to Wilmore. 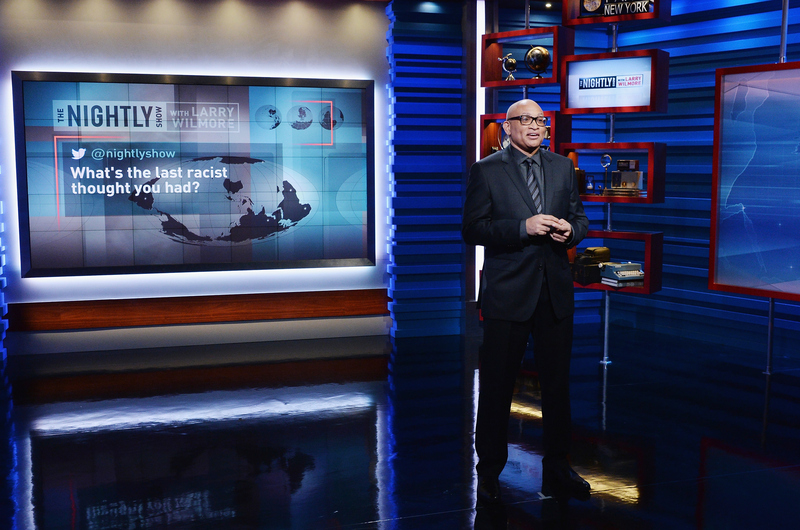 For The Nightly Show premiere, a staff member posed this question to Wilmore: "What's the last racist thought you had?" His answer? "Does that white woman think I’m gonna steal her purse?" Seems like Wilmore will do his part to, well, keep it 100. Maybe we can join him in this inventive new crusade? Honesty all around!